In August 2008 I had to visit Melaka in Peninsula Malaysia for work so I thought I would return to Borneo for a few days. I particularly wanted to see a Flat-headed Cat so decided to go back to the Kinabatang River,perhaps the best place in the world to look for this species. From there I headed to Tabin Wildlife Reserve for three days. 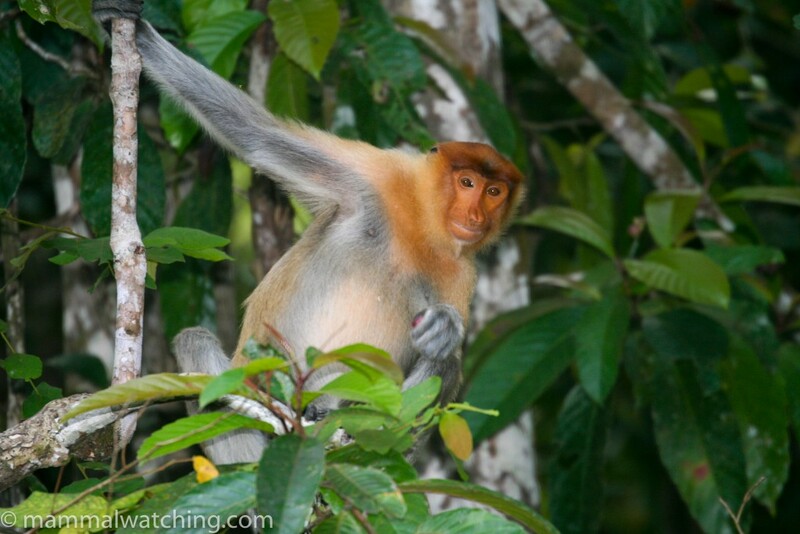 Travelling in Borneo is best arranged through an agency. 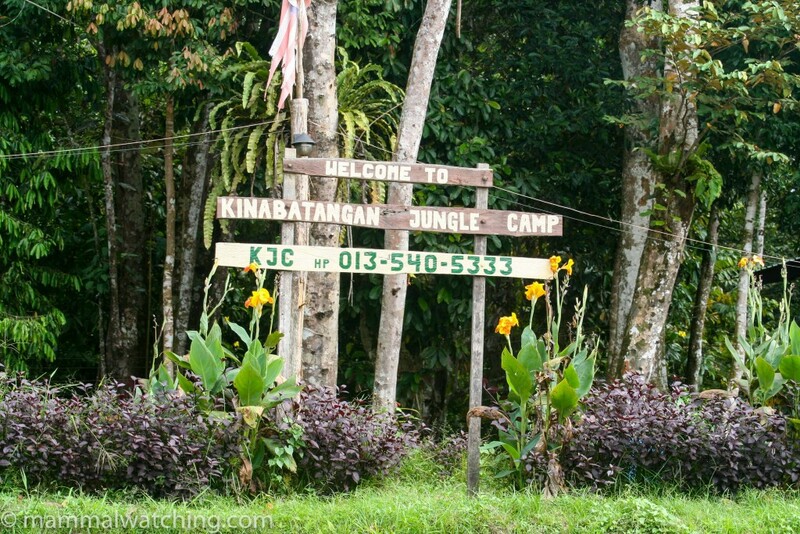 I tried to deal direct with the Kinabatang Jungle Lodge recommended by Richard Webb for their Flat-headed Cat friendly location. But they only answered my first email: when they found out I was travelling alone they didn’t reply to my messages. So I booked everything through Intra Travel in Kota Kinabalu, who Richard Webb has also used. They were good, answering all emails within 24 hours and organising a few extra things that were not part of the standard tourist package ( I dealt with Sabrina Stawin there). Sabrina arranged for Hadi to be my guide and driver. He is a top guy and I will definitely use him again if I go back. He doesn’t profess to be very knowledgeable about the wildlife but is excellent at spotting stuff and genuinely enthusiastic. I daresay he is still talking about the 4 metre long Reticulated Python we saw straddle the road in Tabin. He was also ready to go spotlighting til midnight with me and generally couldn’t do enough to help. I met another guide called Kenneth Tizon who works freelance and seemed to know a good deal about mammals who might also be a good contact. I arrived into Sandakan at 16.45 direct from Kuala Lumpur and met Hadi. 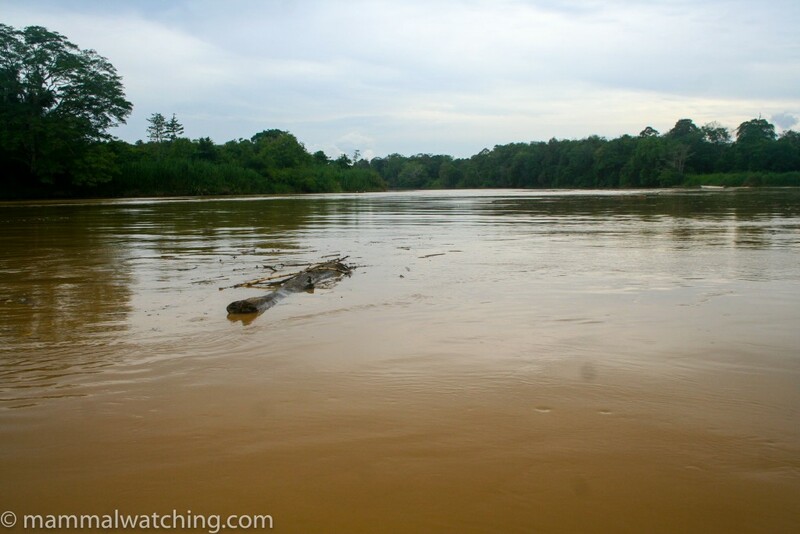 The Kinabatang Jungle Lodge is one of the more basic lodges along the river. But the staff were friendly and the food tasty. It is also well set up for naturalists (mainly birders) and it is easy to do ad hoc stuff like extended night tours if you want to see a Flat-headed Cat. You can contact them direct, through Robert Chong at labukbb@yahoo.com, though I didn’t have much luck getting a reply. Most of the action along the Kinabatang happens from a boat. I took two morning and two late afternoon trips. 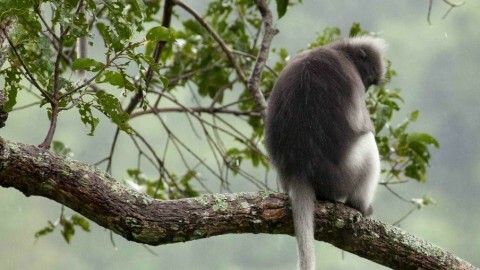 I saw Long-tailed Macaques, Silver Langurs and Proboscis Monkeys each trip. 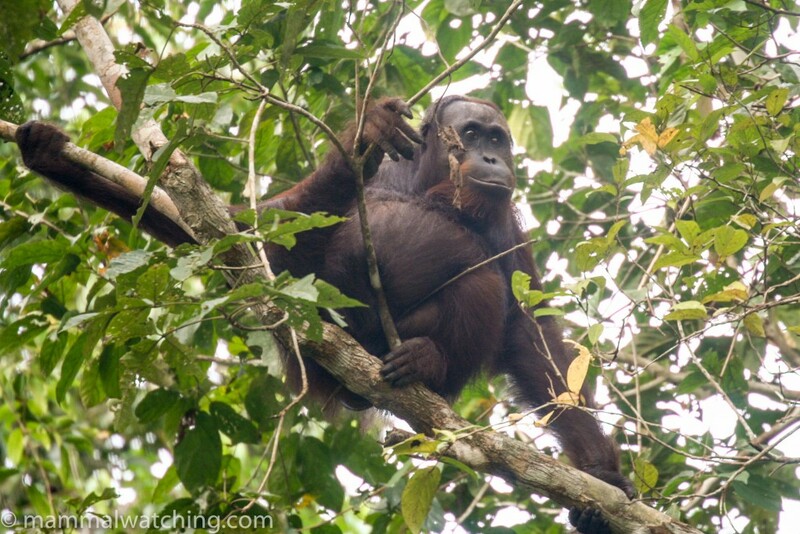 I also saw one Orangutan, an Elephant (upstream) and Pig-tailed Macaques near Sukau. 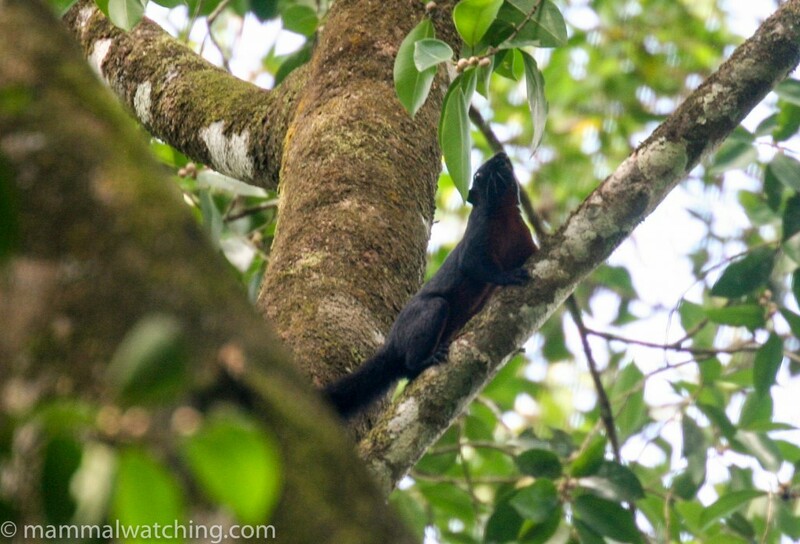 And I spotted just one Plaintain Squirrel and a couple of Plain Pygmy Squirrels. One afternoon we headed up stream a fair way and apart from an Elephant, we heard a roar that Hadi said was a Sun Bear. 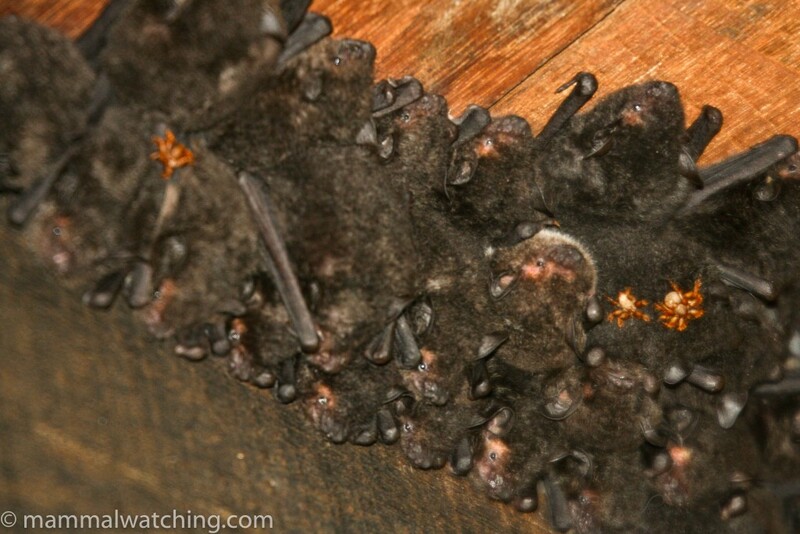 Around the lodge itself there were numerous microbats and I caught a couple of Fawn Leafnosed Bats (Hipposideros cervinus) that were feeding around the light outside my room,. There were also a few Plain Pygmy and Prevost’s Squirrels. The trail (about 1.5 km I guess) around the lodge’s block of land was very good for Orangutans. I saw five in three separate groups during two morning strolls. Plaintain Squirrels were common and I saw a Bearded Pig feeding on fallen figs. 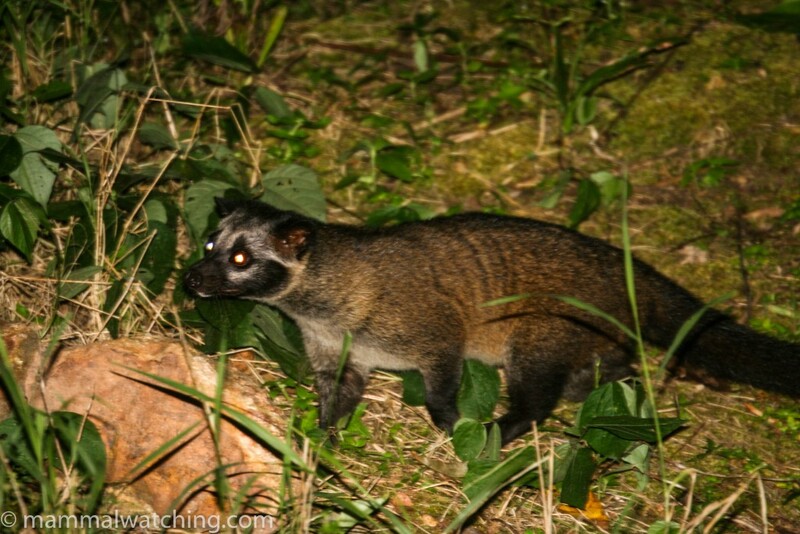 My spotlight batteries were dying and so I walked just a bit at night and saw a Malayan Civet. We took three night trips by boat. The water had risen the day I arrived which meant Flat-headed Cat watching wasn’t ideal. 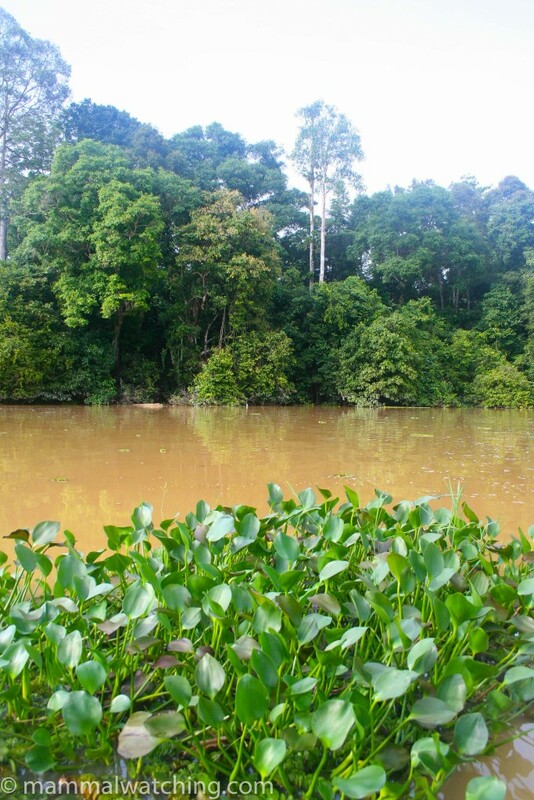 The cats hang out mainly along the banks of tributaries to the main river and if the water level rises they are pushed back further into the forest. Although we were looking out for the cats most of the cruise took place along the main river and didn’t maximise my chances. 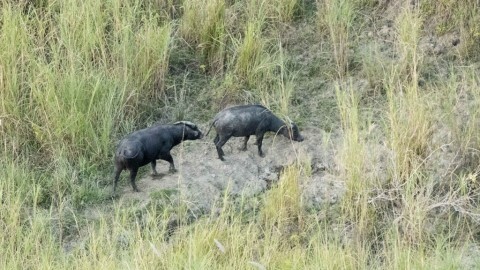 During the first night cruise the only mammals we saw were a few Large Flying Foxes. 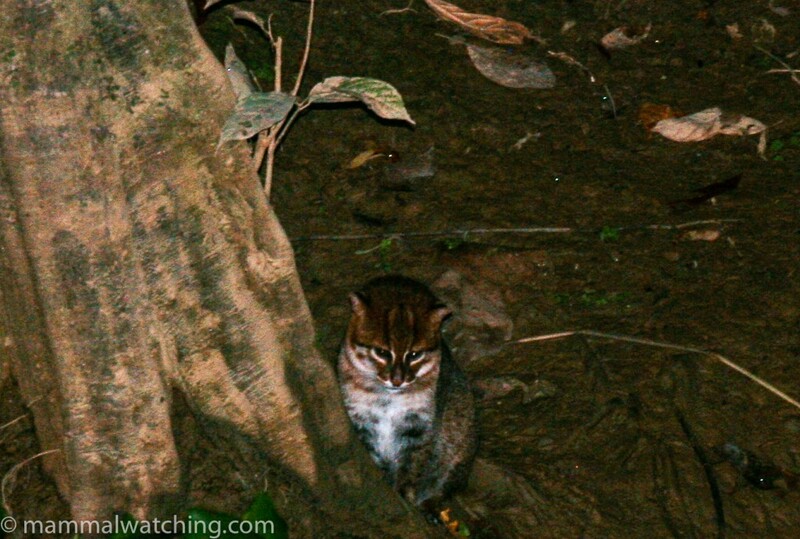 The second night was worse: we saw no mammals, but the lodge’s other boat saw a Flat-headed Cat 30 metres up the tributary. We raced back but missed it by a couple of minutes. On the third night I arranged to go out on my own with the boatman who was the resident Flat-headed Cat finder-in-chief. He also agreed to stay out til midnight or until we found one. The water had dropped over a metre since I arrived so things were looking up. And within two minutes of leaving the lodge we saw what appeared to be a cat at the edge of the river. But we approached it to fast and though I was fairly sure was a cat with a long tail I cannot say much more. I guess it was a house cat. 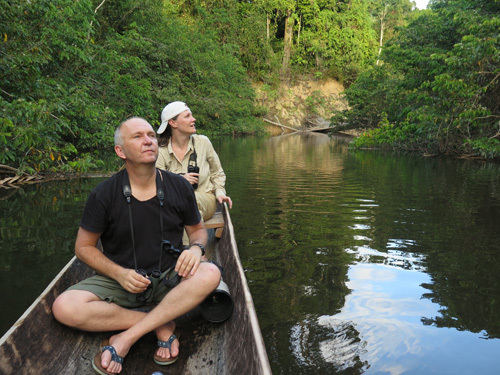 We spent the next hour going slowly down the tributary until the boatman spotted a Flat-headed Cat. I had great views for over 20 minutes of the beautiful little thing. Black clouds were looming so we dashed back to the lodge but were three minutes too late. Completely soaked. Banded Palm Civets are quite often reported from the Kinabatang. I missed out and apparently your best bet is to look in a fruiting fig. The drier season – June through August – is the best time of year to see Flat-headed Cats. Hadi and I left the Kinabatang for the four hour drive to Tabin stopping at Gomantong Caves en route. 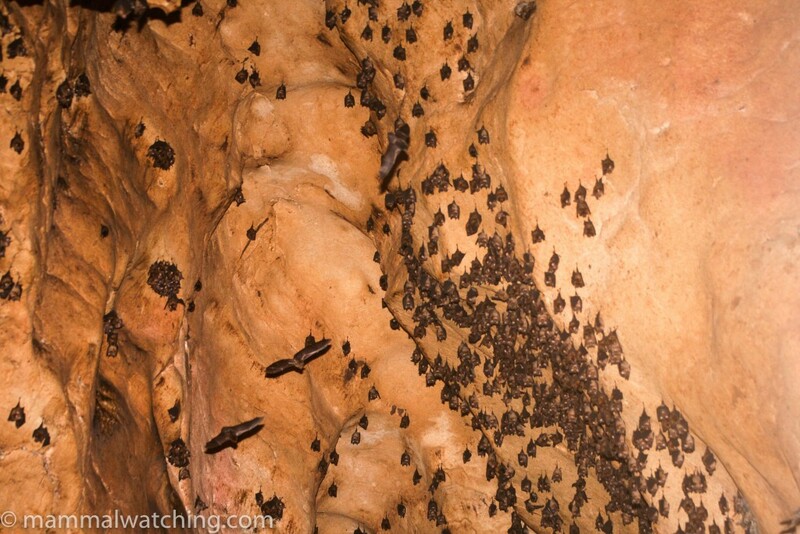 There were lots of Wrinkle-lipped Bats and many roundleaf Bats (some looked like Hipposideros cervinus) inside, together with some Short-nosed Fuit Bats (Cynopterus brachyotis) roosting under the eaves of a white building in the car park. Tabin is a comfortable hotel on the edge of a big chunk of good forest amidst palm plantations. I didn’t know much about the place other than what I’d read in a trip report from Richard Webb and that my Thai friends Tu and Jan had seen a Clouded Leopard and some other good mammals there during a long visit in April 2008. Richard was quite disappointed with Tabin. I had my own vehicle which helped relieve my frustration, so I was able to take long night drives without any problem. That said, his comment about the quality of the guides still stands. My guide, Jodi, was pleasant but wasn’t great at finding animals. He pretty much disappeared after the first evening drive and apparently he was sick and so spent most of his time asleep, something he does well. The hotel has recently been taken over by the government and – surprise surprise given this is Borneo – the quality of the food and general running of the place had deteriorated. Overall Tabin has potential, and the lodge was more flexible than Borneo Rainforest Lodge in 2004, but some small changes and better guides could make a world of difference. Marlin is an excellent guide and I would try to use him if I returned. The lodge manager – Mr Simon – was also very knowledgeable and I wish I could have talked to him more. 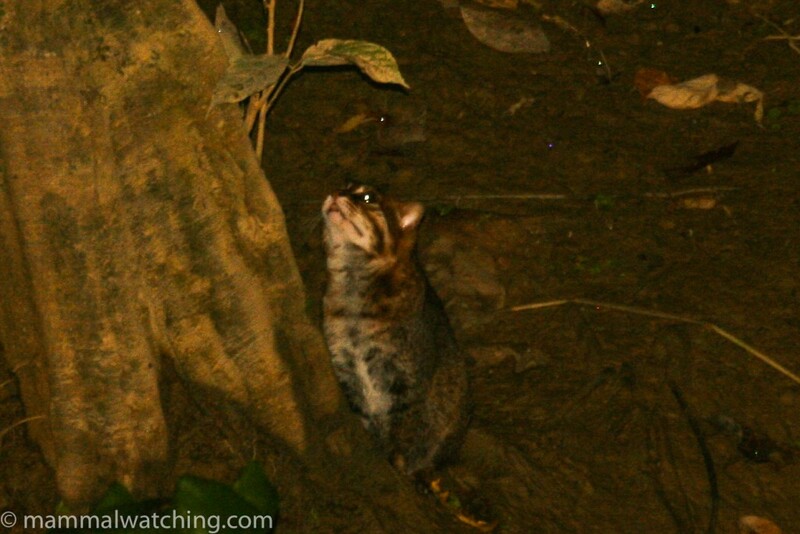 A drive on the first night from 6 – 8 p.m. got a Masked Palm Civet (my first good look at this animal), a couple of Leopard Cats and a Black Flying Squirrel, as well as a 4 metre long Reticulated Python crossing the road. There was a Lesser Mouse Deer grazing in a garden back at the park HQ. 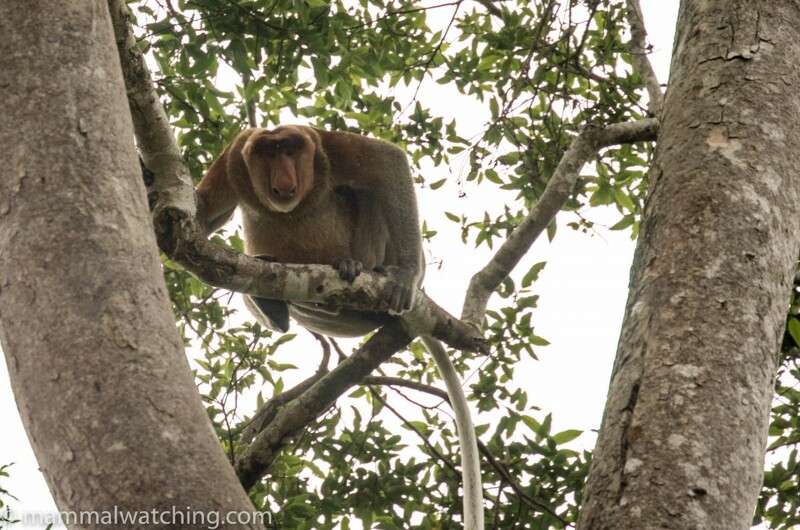 We headed out after dinner along the road to the core area of the park for a couple of hours and saw Sambar, a Malayan Civet, a couple of Giant Red and one Thomas’s Flying Squirrel and some Giant Flying Foxes. 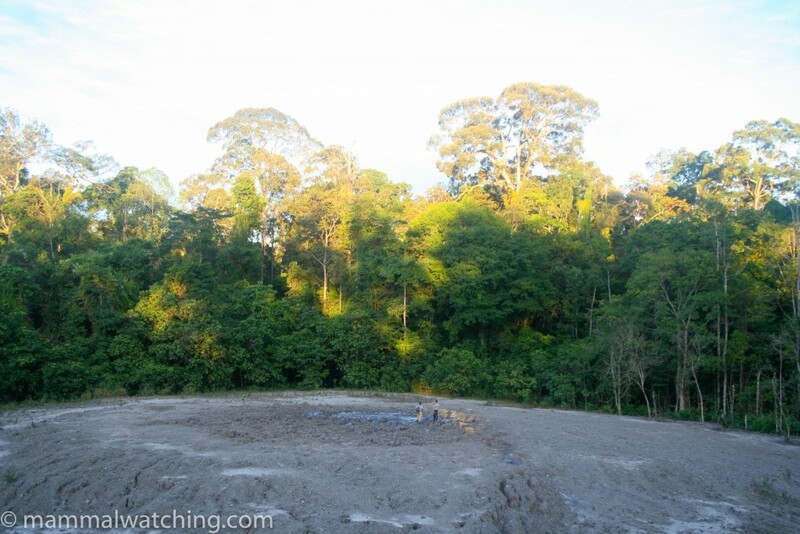 I chose to spend the second night camping out on the observation tower overlooking the mud volcano, something Richard Webb had done. 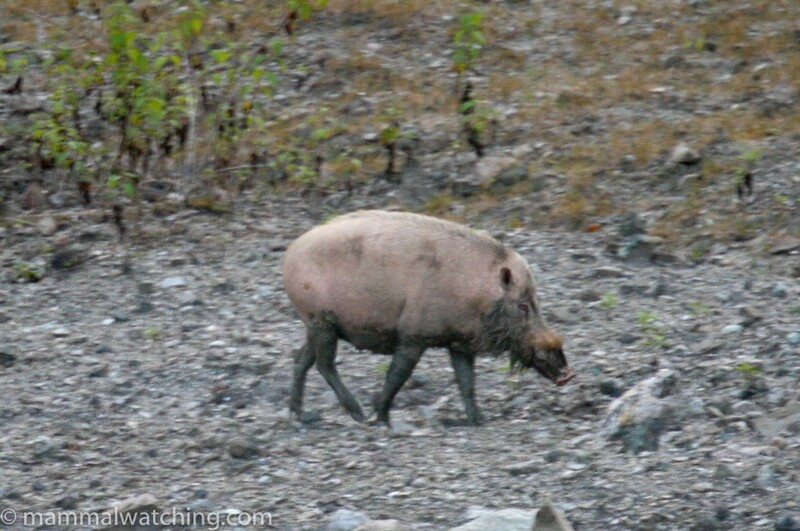 It was a fun thing to do but the wildlife watching was disappointing to non-existent and the mammals comprised many Bornean Bearded Pigs and a Sambar Deer. The bright full moon made seeing the mammals easy (particularly as my spotlight packed up) but it may have put the animals off from coming out of the forest in the first place. Or perhaps they were put off by the loud snores coming from Jodi two floors below me. 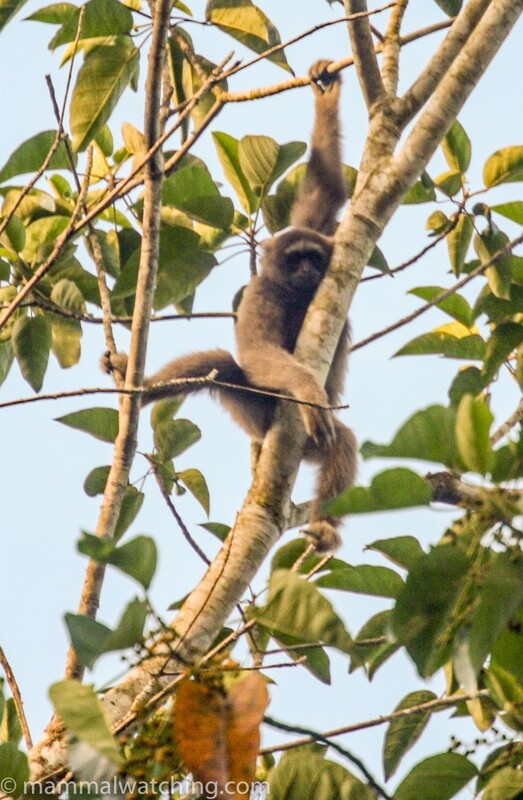 There were heaps of Bornean Gibbons calling in the morning and I saw a family along the road at the start of the short trail to the volcano. Back at camp and along the Sambar Trail I saw a Greater Mouse Deer, Prevost’s and Low’s Squirrels. 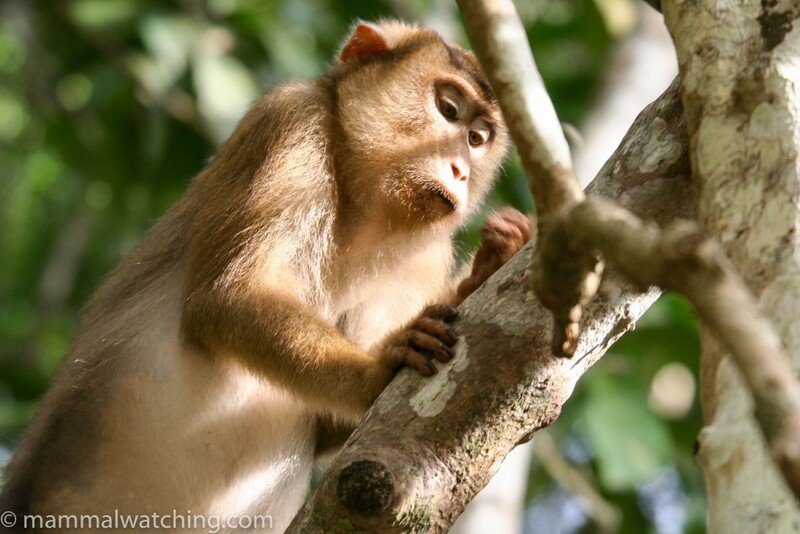 There were some Pig-tailed Macaques opposite my room. 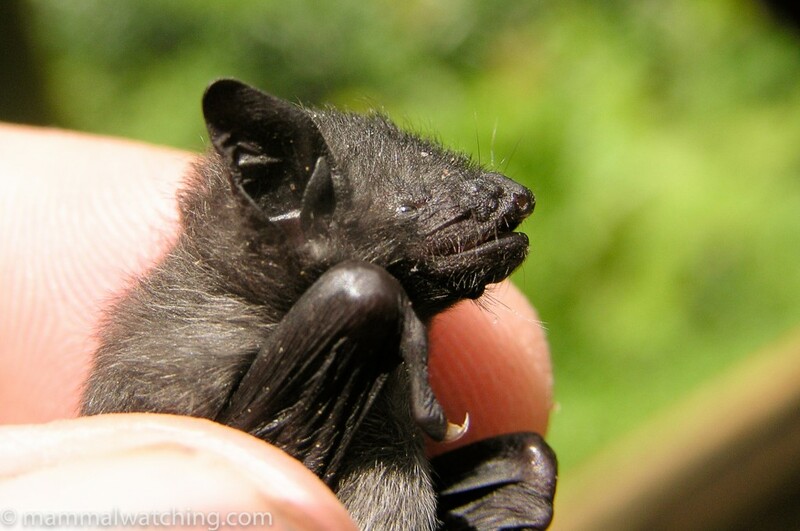 My buddy Tu had told me to look for a colony of Ridley’s Myotis living under river cabin 5 and they were still there. Hose’s Langurs (Grey Leaf Monkeys) are often reported around camp and I finally tracked one down at 5 p.m. on my last afternoon near one of the park buildings, just 100 metres from my room. Bornean Gibbons were hanging out in the same area. Heavy rain set in at 5.30 p.m. on my last night which I thought would bode well for the night drive, provided the rain stopped of course. It did stop, bang on cue after dinner, but the night drive was not the repeat performance of a spectacular drive I’d taken after heavy rain in the Danum in 2004. 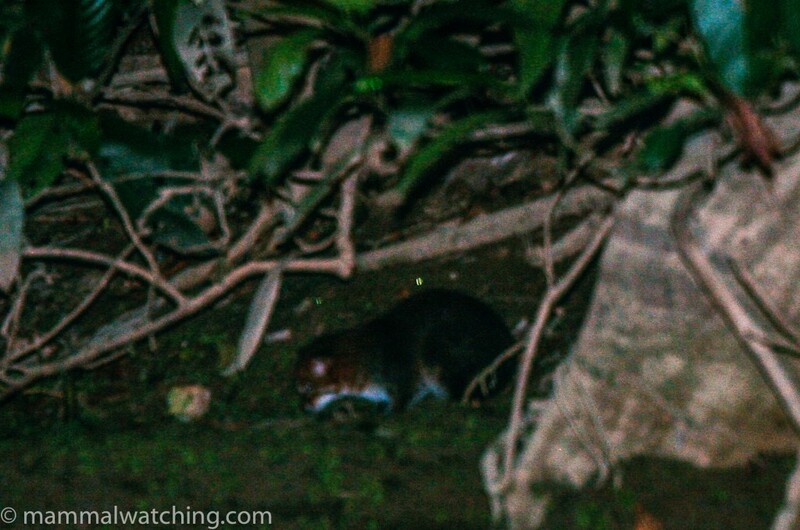 In 2.5 hours I saw a couple of mouse deer, at least two unidentified flying squirrels, a couple of Leopard Cats, a Common Palm Civet and what was probably a Moon Rat scuttling off the road as well as another smallish rat species. I also heard an Elephant trumpet at very close range. At 11 p.m. I took a quick walk along the half finished nature trail across the river from the lodge where Simon, the park manager, said he thought there were Tarsiers. He’s something of an expert and had smelt their latrine site. I think I found the smell (a sort of ‘bat roost’ smell) but I couldn’t find the Tarsiers. Truth be told I am not sure I found the trail. I was out on a 4 a.m. pre-dawn drive on my last morning, which produced Bornean Bearded Pigs, Sambar, a Leopard Cat, the sound of another Elephant and my first Bornean Yellow Muntjac (along the Tabin Road). Clouded Leopards are seen occasionally here, and Jodi, my guide, said he had seen Marbled Cats twice in July. Sun Bears often raid the plantations at night. 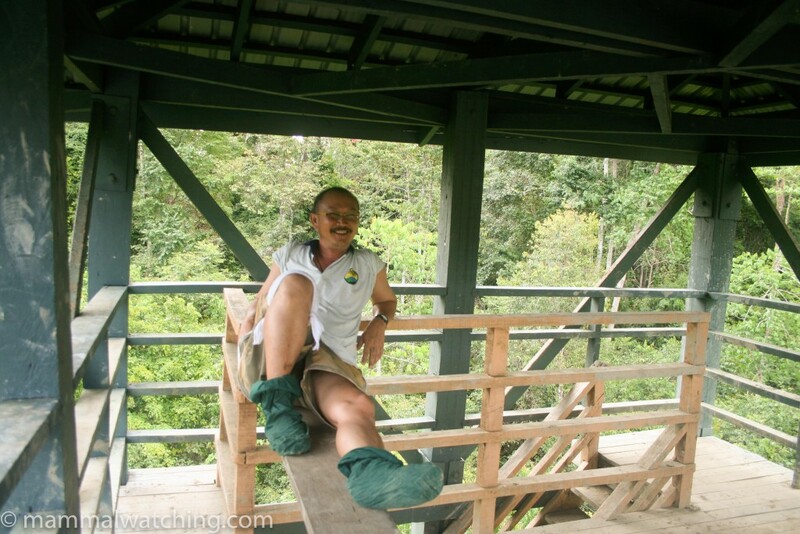 There are Sumatran Rhinos in Tabin but the chances of seeing them are tiny. 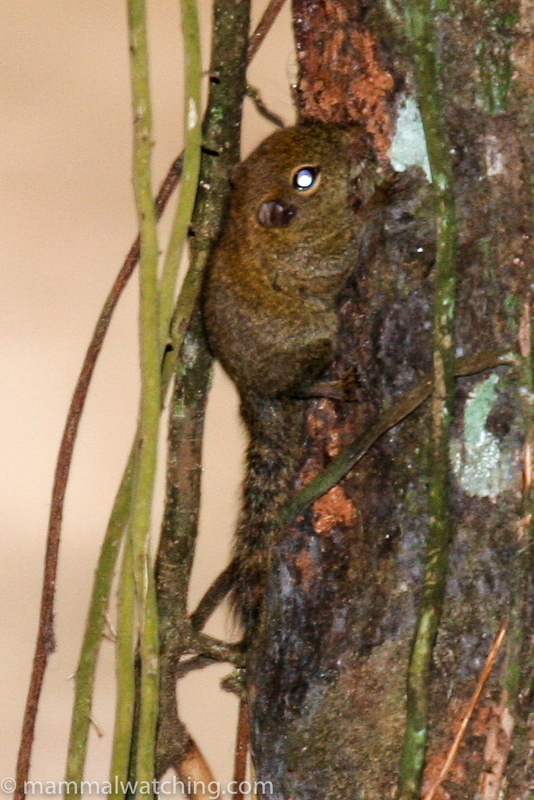 Tarsiers are around but not easy to see, though they may be easier in February March time alledgedly. Just about every report in the sightings book over the past couple of months had noted Otters (mainly Small-clawed Otters and less often Smooth Otters), with a group of about 25 Short-clawed Otters being seen every other day outside the lodge. Unfortunately they left the day before I arrived and did not return. 4. 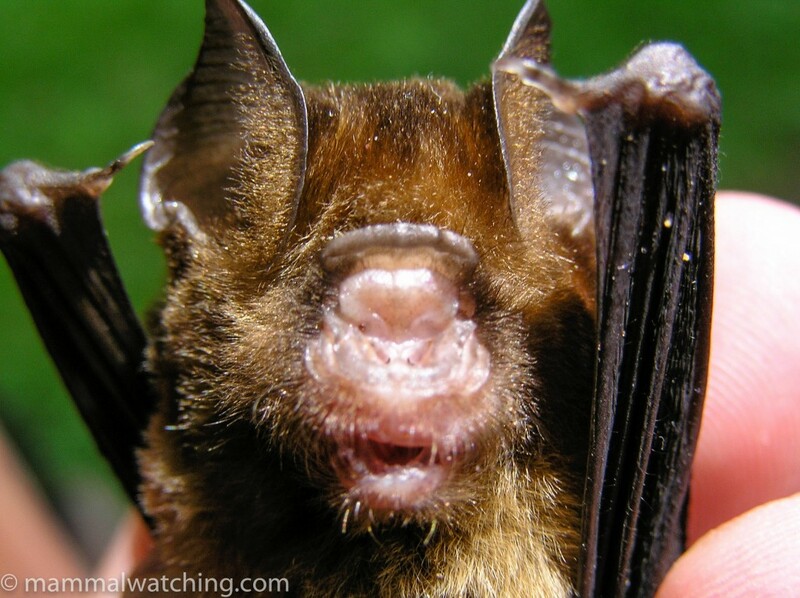 Fawn Leafnosed Bat (Hipposideros cervinus) K, G?